A plane, even in retirement, is still useful and can bring big profit as soon as you upgrade it to a new type of aircraft. Such upgrading is possible for a lot of planes including An-2, even taking into consideration the fact that this is a classic layout biplane. There is an organization, dealing with experimental aircraft upgrading. Its specialists have several ideas how to use An-2 in different spheres. One of them is the proposition to the Russian Cosmonautics academy. The idea is to use aerodynamic ground-effect crafts, designed on the basis of An-2, as the first stage of mini-satellites delivery system to the near-the-earth space. An-2 is well-known around the world. It's been used in 26 countries of the world. Even today in Europe the annual meetings of owners and fans of this plane are held. Today in Russia and CIS countries there are about 3000 An-2 planes which are considered to be able to fly. But the majority of them are bound not to leave ground. Of course, as years go by, the planes lose their ability to fly and their life ends. Moreover, the An-2 repair costs about 25000 USD. As we know, a plane on ground brings to the air-transport organization only losses. But to use An-2 today is even more loss-making. Does that mean that it's cheaper to keep the plane on the ground? Well, if you think about gas and oil prices, it might seem so. 1000-hp AS-62IR engine needs about 160 litres of Avgas-91 (B-91) and 6,5 litres of MS-20 oil per hour. Don't forget about pre- and post-flight maintenance, routine maintenance, the costs of parking at the airports, services of air-traffic control and the crew salary. If you sum up all the expenses and remember the fact Avgas-91 is really rare these days, then you'll lose all the doubts about how long the planes will have to stay on the ground. But in Western Europe An-2 plane is very popular and not only because this plane is very cheap in Russia and CIS countries. For example, in 1992 at the aeroshow in Oshkosh (USA) the representatives of Poland aircrafts producers sold a new An-2 for 225000 USD, but today in CIS countries you can buy an An-2 with a short remaining life for 5-10 thousand USD. There is an agency in Kazakhstan that owns just several dozens of the planes and offers an An-2 for 1500 USD. Of course, that's really cheap. That's even cheaper than the metal (if you consider it to be scrap metal) and equipment costs (producers of ultralight planes buy every device for 40-60 USD per unit). Nevertheless there is a real possibility to reequip a "retired" plane or plane that is bound to spend the rest of its life on the ground because of economic reasons into a new aircraft with operational costs lower by 3–4 times, and its market price will be twice higher in comparison with an old plane. In short, old planes modernization can be profitable both for the producers and owners of the new aircraft. As we know, when comparing different types of aircrafts one of the most objective cost-performance charcterictics is the efficiency of fuel usage — that is specific fuel consumption (sfc), i. e. the quantity of fuel, needed to transport 1 ton of cargo for 1 km. In pic. 1 you can see how sfc depends on the speed of flight for different types of planes and aerodynamic ground-effect crafts. As you see, when the speed is between 80 and 550 km per hour, the efficiency of fuel consumption for aerodynamic ground-effect crafts is obviously higher than that for the other types of the crafts. To give a better overview let's have a look at Table 1, where we can find the average values of this characteristic for other types of transportation. For passenger planes and aerodynamic ground-effect crafts there is another characteristic of work efficiency: fuel consumption per passenger-kilometer. For An-2 this characteristic is 42 g/passenger-kilometer. The best contemporary jumbo jets' fuel consumption per passenger-kilometer characteristic is pretty low (sometimes it reaches 18 g/passenger kilometer) thanks to high aerodynamics, high operating speed (860–910 km/h), economic high bypass ration engine. But it is possible to get even better characteristics of specific fuel consumption for aerodynamic ground-effect crafts designed for 15–40 passengers even at speed of 180–250 km/h. For example, aerodynamic ground-effect craft An-2g (An-2e) will have 4–5 times lower sfc than An-2 and this characteristic will be twice better than that of the jumbo-jet — just 9 g/passenger-kilometer. 40 passenger aerodynamic ground-effect craft with car-engine specific fuel consumption can be decreased to 4,5 g/passenger-kilometer. This can be done because of high aerodynamics of the craft when it flies close to ground (K=18–27) and because it uses a less powerful engine with comparison to a plane of the same take-off weight. Well, really all the extra-power of the aerodynamic ground-effect craft engine is needed only to overcome the hump drag, but the vertical speed can be only 0,5–0,6 m/s. But regulations of the International Civil Aviation Organization (ICAO) prohibit to use the planes with vertical speed less than 1,5 m/s in commercial sphere. Well, commercial plane Po-2VS (military craft) did have the vertical speed of only 1,2 m/s, but this plane was not connected with ICAO and even ICAO itself didn't exist then. Therefore we see that it is possible to increase the horse power loading for the aerodynamic ground-effect crafts up to 12–15 kg/h.p. At the same time it is possible to use gas car engines and even diesel engines. Their price is 4–6 times lower than that of the aviation engines, maintenance is cheaper and easier, and one can buy fuel and lubricants at every gas station. At the same time diesel fuel price amounts to about 60% of the gas price (but in the Ukraine diesel fuel today is more expensive than low-octane gas A-76 — editor's note). And of course you can't compare diesel fuel with high-octane aviation gas: the first one is much cheaper and more environmentally friendly. Diesel fuel is considered even ecologically cleaner than unleaded extra gas, because the combustion process in diesel engine is more intensive and the fuel burns down completely. An ordinary gas engine need a catalyst converter, direct injection and a microprocessor to lessen the exhaust fumes toxicity (if the engine fulfills the Euro-2 standards). Nevertheless you can find a car engine on a commercial plane pretty often. These are not only the Limbach water-cooled engines (a model of the famous Beetle VW engine) but also water-cooled engines, often described in General Aviation magazine. Lately the car engines have been widely used not only for the light planes, but for delta crafts as well. At the sports aviation exhibition in Friedrichshafen (2001, Germany) these engines were represented by several agencies, dealing with car engine modernization. There were represented engines of BMW, Mercedes, VW and even a range of turbo-rotary engines of 37–150 h.p. capacity. But contemporary aircrafts don't use aviation diesel engines so far. Of course, aviation diesel engines were used for the long-range bombers Pe-8, Er-2 and IL-6 during World War II. 10.08.1941 diesel planes Pe-8 and Er-2 attacked Berlin. German planes Me-111 flew with aviation diesel engines during the war. A lot of people don't know about diesel engines because at first these engines were classified and after the war there appeared turbo-propeller engines, so it was easy to forget about diesel engines. Taking into consideration the fact that contemporary car diesel engines are highly developed and not heavy, we can think that one day inventors will take the car engines and put them on their planes, far from roads and highways — and this will pass unnoticed by professional aircraft designers. A car diesel engine can be successfully used for the aerodynamic ground-effect crafts even today. You don't have to fulfill the high aviation standards for a diesel engine for a ground-effect car. Moreover, an aerodynamic ground-effect craft flies in the landing mode. It can be compared with the flight of the plane when it's ready to land and it's altitude is just several meters above the runway. The aerodynamic ground-effect craft keeps on flying above endless runway (ground) as if it is going to land. That means that the engine problems are not dangerous for it. The ground-effect craft flight is like a very long landing that started right after the take-off and lasts right till the point of destination. At first sight one can think that a diesel engine on an aerodynamic ground-effect craft can lead only to extra-weight and expansion of the engine nacelle. But don't forget that in 1940s, before the time of turbo-jet and turbo-propeller engines the world aircraft designers considered diesel engines to be promising aviation engines. So let's think if it is possible to reach the harmony of a car diesel engine and a ground-effect craft, based on An-2 plane. As we know, the take-off (maximum) capacity of AS-62IR engine is 1000 h.p. It is needed for a short take-off and vertical speed of 3–5,5 m/s with full cargo. But for horizontal flight at the speed of 190 km/h in third operational mode (K=10) An-2 will need only half of its nominal capacity — that is 410 h.p. 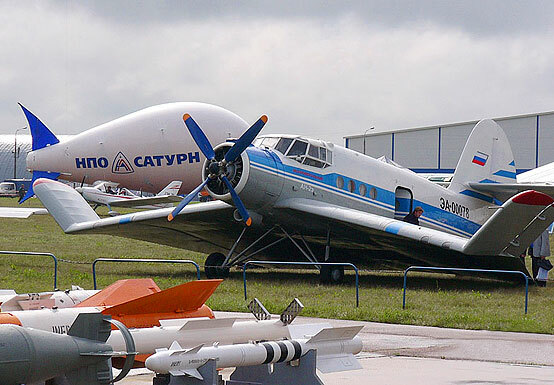 An aerodynamic ground-effect craft, constructed on the basis of An-2, depending on its full cargo, will need a diesel engine of only 360–420 h.p. to overcome the hump drag when taking-off. Ground-effect craft An-2 with aerodynamic quality of about 20 needs capacity of only 300 h.p. to fly above the ground. Propeller engines of this capacity (Nmax 360–420 h.p.) for aerodynamic ground-effect crafts can be designed on the basis of car diesel engine KAMAZ-740, YaMZ-7511. Such engines will weight about 760–850 kg — just as much as aviation engine AS-62IR with a propeller and equipment. But AS-62IR engine set on an An-2 needs about 1240 l of aviation fuel (about 1000 kg). At the same time a diesel engine will need about 250 l., that means that the weight will be 800 kg less. That means, that the work load on a ground-effect craft can be increased up to 2300–2500 kg instead of 1500 kg for An-2. Of course, one can say that there is no need to work with a car diesel engine, when it's possible to install usual aviation engine M-14 of the same capacity, together with a propeller and a cowl panel weighting about 340–365 kg. You can start using this engine on an aerodynamic ground-effect craft right away, you won't have to reconstruct it, to built special propellers and gear case for a diesel. But M-14 engine today costs 28 000 USD, when a car diesel engine costs about 5 thousand USD. Moreover, fuel consumption for M-14 is about 52–54 liter/h. That means that it will need about 400 liters of aviation fuel and 30 kg of aviation oil. And if you remember that the exploitation costs and maintenance of M-14 is 5–6 times more expensive than those of a car engine, you'll see that it's high time to let the diesel engine in. There is a good example today — Charomskiy car diesel engine. An aerodynamic ground-effect craft is a very good step into the skies for a car diesel engine. A ground-effect craft engine doesn't need to fulfill high aviation standards, the required specific weight and safety of the propellers are lower. The economic advantages of an aircraft with a diesel engine and high exploitation profits are the best arguments for the aviation diesel engines. And the idea to use commercial craft to create new experimental planes and aircrafts is not new. We know that at the end of World War II Germany produced experimental planes, successfully using already existing commercial landing wheels, wings, and parts of fuselage. The USA created a troop-carrying craft on the basis of a military-transport plane C-47. Our country experimented in this sphere as well. Here you go, just several examples. Markalov "family" plane "Stork" 123M was created by professionals on the basis of Czechoslovakian practice plane "Zlin". Famous professional pilot A. Baluev built its wonderful plane "Danko", basing on the design of Yak-12. Agency "Roks-Aero" created multipurpose plane T-101 "Grach" on the basis of An-2. Moreover, the agency prepared the plane for the type certification, and MiG-union built 24 T-101 planes. Except for this "Roks-Aero" designed plane T-411 "Aist" with M-14 engine using the design of Yak-12М plane. T-411 flight performance is significantly higher than this of Yak-12М. And one more example: in 1986 the Naval Forces of China started using multi-purpose aero-boat SH-5 "Harbin" (pic.2). The aircraft carried out its first flight on 3 April 1976. After three aero-boats testing in 1984 the Harbin plant started commercial production. The construction of these boats incorporates details of Russian planes An-12 and Be-12: wings, tail group, parts of fuselage, power-units and equipment. The wings of the boat hold special pylons for antisubmarine weapon and missiles, produced in China. Four engines and new wings allowed to increase the take-off weight by 10 tons and the working load — by 7 tons. The battle characteristics of the aero-boat were improved as well. Of course, this is a craft of another type, thought based on a well-known plane design. So An-2 is the ideal base to built the aerodynamic ground-effect crafts — and perhaps other crafts as well. Moreover we have some nice examples of using commercial crafts to build ground-effect planes. The Central Laboratory of Rescue Technique created and tested aerodynamic ground-effect craft ЭСКА-1, but the governmental organization didn't support that work. So in 1974 I applied to Riga Red Banner Civil Aviation Engineers Institute (RRBCAEI) and offered to work together and use aviation techniques for ground-effect crafts. At that time there was a branch of "State Civil Aviation R&D Establishment: Ground usage of aviation techniques and equipment" in Riga. This agency offered to use aviation engines and equipment to build hydroplanes, snow-planes, air-cushion vehicles and aerodynamic ground-effect crafts. This offer included a long list of equipment that could be used for rescue techniques design. There were engines, tanks, wheels, skis, pylons, tail propellers and floats in this list. Of course, RRBCAEI and Riga Branch of State Civil Aviation R&D Establishment were close partners not only because of their work, but because they were situated in the same city. Moreover RRBCAEI student development laboratory had had the experience of planes redesign on the basis of commercial crafts and equipment. RRBCAEI saw several graduation projects, introducing ground-effect crafts of different types and purposes. I consulted students, working on the graduation projects about ground-effect crafts design, based on An-2, Yak-12, Yak-40 planes. These projects were initiated by the Central laboratory of Rescue Technique. Apart from this, the laboratory designed ground-effect crafts on the basis of Li-2, Il-14, An-22 as a part of graduation projects. An-3 plane is a further development of An-2 planes, which has a good reputation in the world because of its good flight performances, simplicity in exploitation, ability to use almost every airport and high safety. An-3 enjoys all the good qualities of old An-2 and can be used in all spheres of aviation operations. The main changes are: piston engine AS-62IR was replaced by turbo-propeller engine TVD-20 (it's more powerful and can use any aviation fuel), the design of the cockpit was changed and it incorporated an air-conditioning system; the electrical equipment was renewed and the system for installing agricultural equipment was improved. By copying and retransmission on the Internet url is required — «Site about plane An-2».